Theres something about trying a new recipe and then it turning out AMAZING, that making a recipe already tried cannot give. This was the first time i made these muffins and they turned out to be great. they are any kids choice and adults delight and my absolute new favourites. The recipe was supposed to be tested and tried yesterday but with my pugs 5th birthday i found myself a little too occupied. So when today everybody was fast asleep early in the morning i found myself alone in the kitchen with light music and my hand mixer. It was a date and a wonderful one, nothing can garuntee a good day like baking early in the morning can. 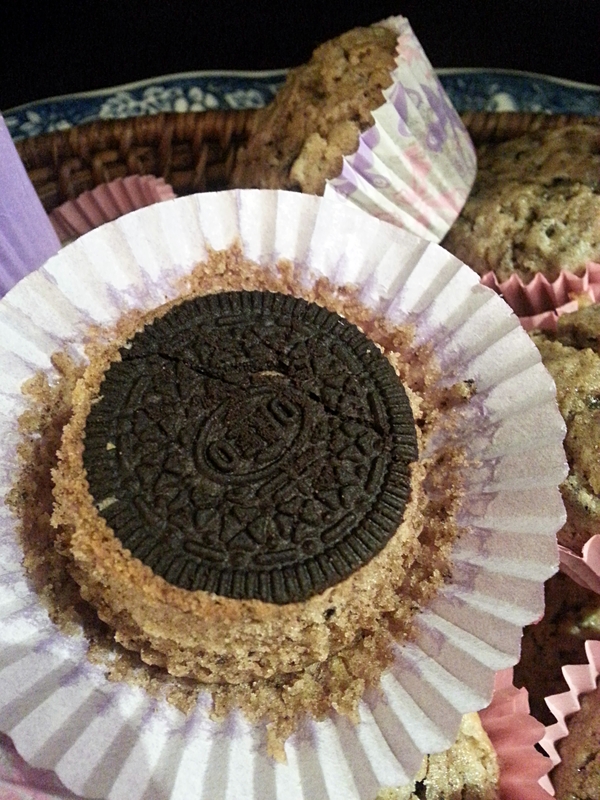 This was the first time i tried a biscuit based muffin recipe, that was truly all about the love for Oreo biscuits ( my younger daughter is truly a fan). 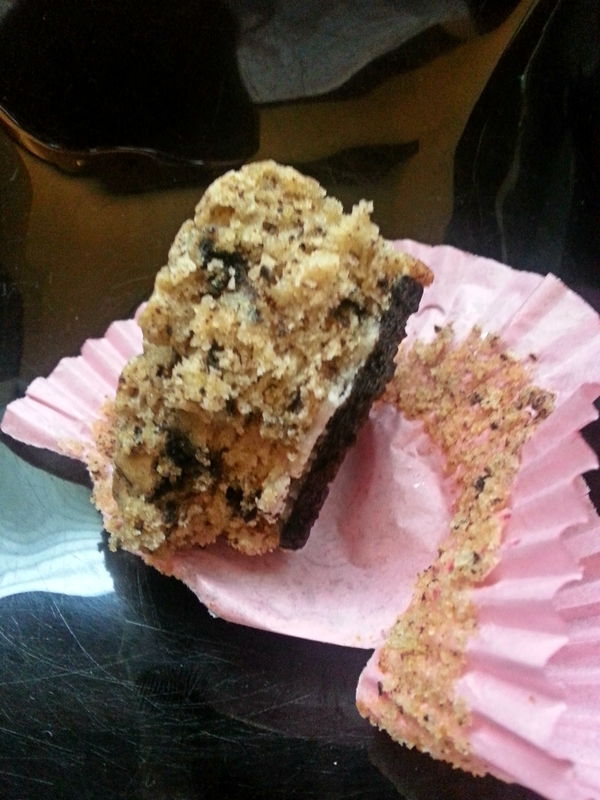 It was a cookie and cream ice cream in a cupcake. A match made in heaven. Preheat the oven to 180 degree centigrade. line two muffin tins with 24 paper muffin cups. 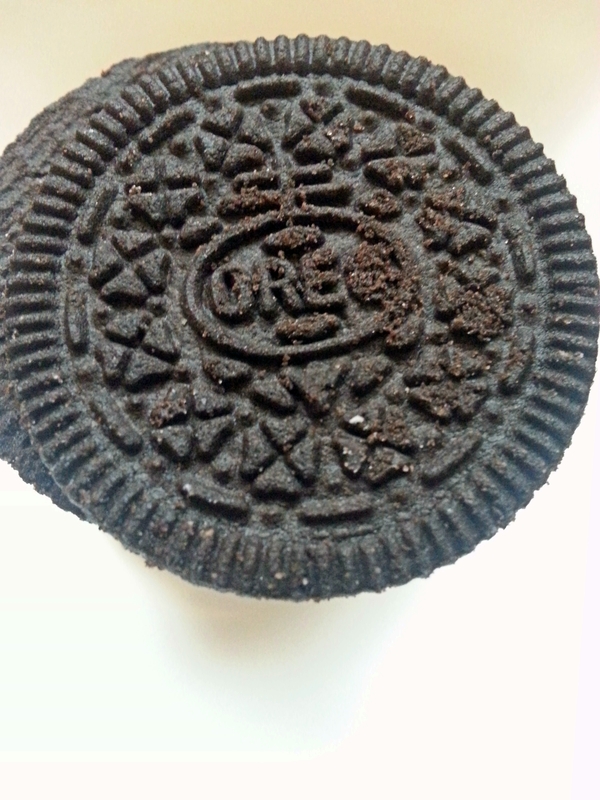 Using a sharp knife, split your 24 oreos into halves leaving cream filling attached to one side (save filling free cookie sides to crush and sprinkle over frosted cupcakes). 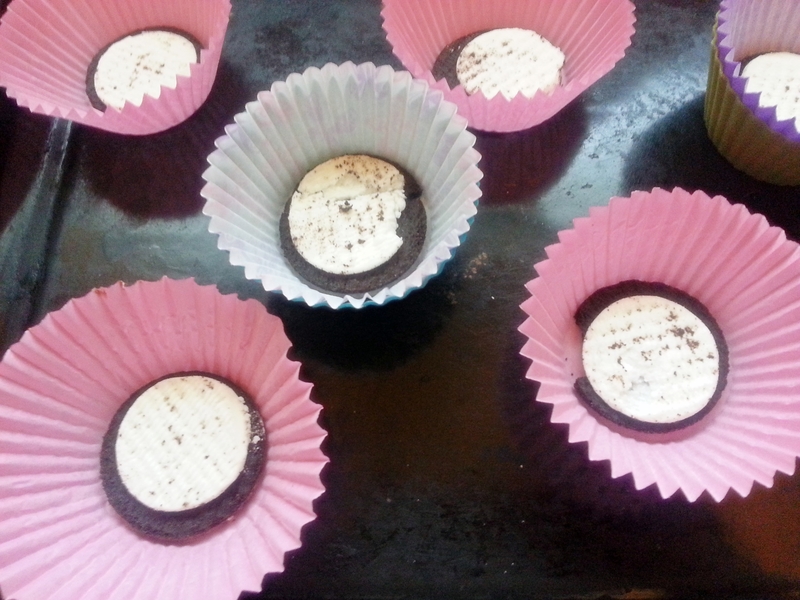 Place one oreo half, with cream filling side up, at the bottom of each muffin cup, set aside. In a large bowl, whisk together flour, baking powder and salt keep aside for the time being.In a separate bowl, using an electric hand mixer on medium speed, whip together the butter and sugar until pale and fluffy for about 4-5 minutes.Add the egg whites one at a time mixing well after each addition. Whisk the milk, sour cream and vanilla extract in a separate bowl. Working in batches, add 1 spoonful of the dried ingredients, followed by the the milk mixture, followed by some more dried ingredients, then the milk mixture followed by the rest of the dried ingredients to the butter mixture. Fold in 16 chopped oreos. Evenly divide batter among prepared muffin cups (pouring it over the tops of the Oreo halves), fill each cup about 2/3 full. Bake in the preheated oven for about 25-30 minutes or until your toothpick inserted in the centre of cupcake comes out clean. Allow to cool completely on a wire rack before you think of frosting them. Meanwhile put the icing sugar into a processor and whizz to remove lumps. Add the cream cheese and butter and process to mix. Pour in the vanilla extract and process again to make smooth icing. Once the cupcakes have cooled completely frost with buttery cream cheese frosting. 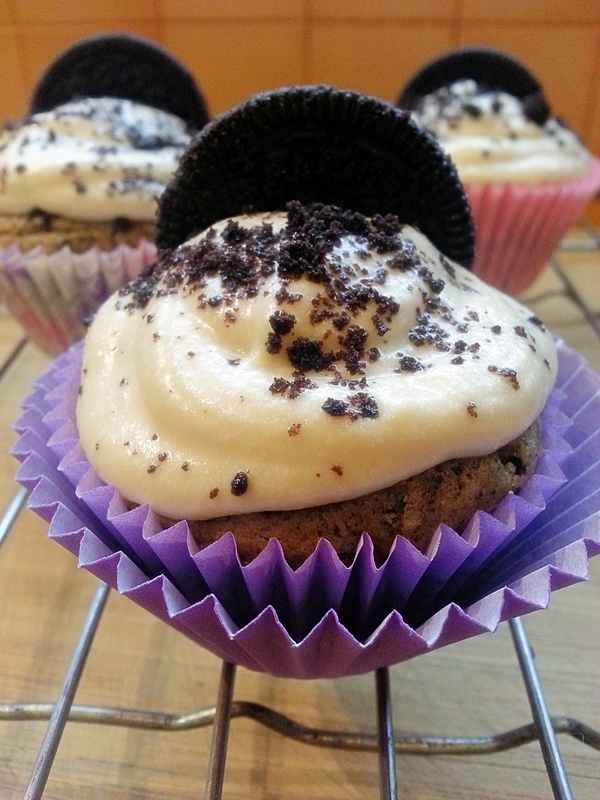 Crush the filling free Oreos and sprinkle them on your frosted cupcakes garnish with cookie halves.